CHICAGO — From the time they are born, we put our boys in blue beanies and our girls in pink ones. It’s a societal norm, an expectation even, that you just are what you are born — a boy or a girl. 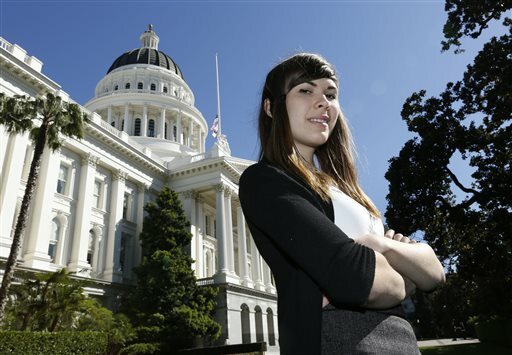 Eli Erlick, 17, stands outside the Capitol building in Sacramento, Calif. on April 17, 2013 after testifying before an education committee. Erlick is director of Trans Student Equality Resources, which provides schools with training and information about students like her. Among other things, the group explains gender differences and how students transition, including name and pronoun changes. 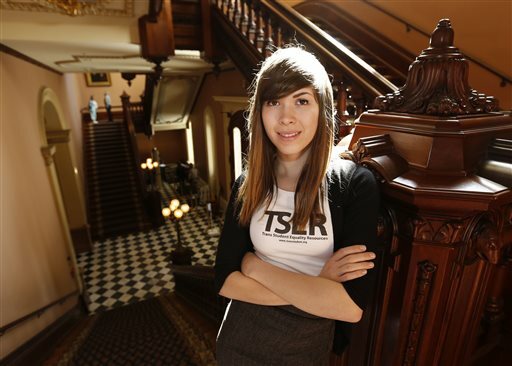 Erlick also has helped her school district and others in California develop transgender policies. It’s not, of course, that pat of a process. Parents don’t just decide to let their kids switch genders. But, whether parents are dragged through the process, or if they decide to work it through more openly, more kids are challenging the boundaries of traditional gender, and going public at younger ages. And they are doing so with the guidance of a growing faction of medical experts who no longer see this as something to be fixed. Last year, the American Psychiatric Association removed “gender identity disorder” from its list of mental health ailments. Some experts predict that views on gender will evolve in much the same way they have for sexual orientation, since homosexuality was removed as a mental illness nearly four decades ago. Today, the gender spectrum includes those who are transgender, who see themselves as the opposite gender, and those who are gender variant, or gender nonconforming, whose gender is more “fluid.” For kids, it means they identify part of themselves as boy and part as girl. “Now these kids . are beginning to have a voice . and I think that’s what’s been making things interesting and challenging — and difficult, sometimes — depending on the family, the kid, or the school,” says Dr. Robert Garofalo, director of the Center for Gender, Sexuality and HIV Prevention at Lurie Children’s Hospital of Chicago. Coy Mathis (left), a transgender girl, plays with her sister, Auri, 2, at their home in Fountain, Colo. Coy’s parents are suing her elementary school after she was denied access to a girl’s bathroom. While the numbers are relatively small, it means that, increasingly, schools are having to figure out how to accommodate them, some more successfully than others. The questions often start with the basics: Which bathroom do they use? Where do they change for gym class? What if teachers or students don’t want to use the pronoun, “he” or “she,” or a new name the student prefers? It can be difficult, and uncomfortable. In Colorado, for instance, the parents of a 6-year-old transgender girl are suing their school district for trying to make her use a separate bathroom. The center at Lurie opened recently, in part, to meet the demand from parents seeking guidance for children who are questioning their gender identity and to provide support to older transgender youth who sometimes struggle more in adolescence, even facing a greater suicide risk, especially if they have no backing from family and others around them. The center also serves as a resource for schools with transgender and gender variant students. 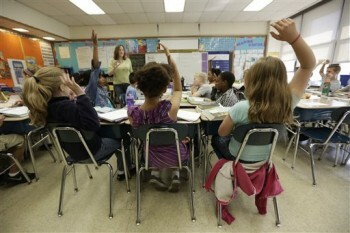 Increasingly, those students are making the transition as early as elementary school, if not before. 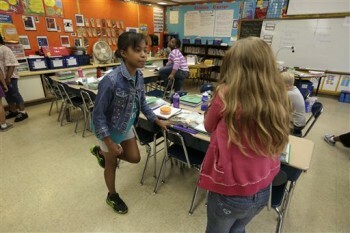 Ryan (foreground, right), is a “gender variant” fourth grader who outwardly lives life as a girl. “I feel that I’m a girl in my heart and a boy in my brain,” the 10-year-old says. 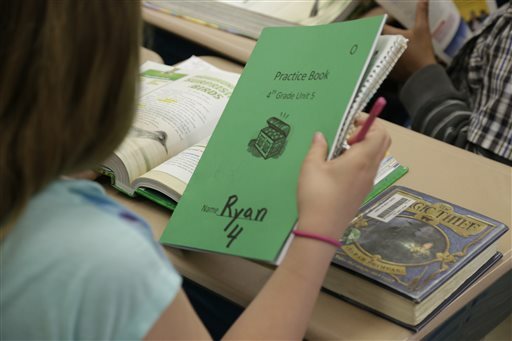 Ryan, a fourth-grader in suburban Chicago, is one of those kids. Most people, upon seeing her big blue eyes, long lashes and flowing blond hair, would never know she’s anything but a girl. But underneath, she is still physically a boy. Her parents allowed her to be interviewed and also agreed to speak to The Associated Press on the condition that the family’s last name, the name of the town where they live and the school Ryan attends not be used in the story. Though the decision to publicly express publicly as a girl happened at the end of kindergarten, Ryan had slowly been becoming “she” at home for a long time, even when she still had a crew cut. Six months after her second birthday, her parents say Ryan was drawn to all things pink and sparkly. Ryan, the boy, wore pajama pants on his head, pretending it was long hair, or acted out girl roles from movies. “I’m wishing . for the one I love . to find me!” the preschooler would enthusiastically sing into the toilet, copying Snow White, who sings into the echoing wishing well in the animated Disney movie. By kindergarten, Ryan would bolt through the door of the family’s suburban Chicago home, leaving a trail of boy clothes up the stairway — then quickly changing into a skirt and matching T-shirt. Ryan’s parents, initially told that Ryan had gender identity disorder, tried to get their child more interested in traditional boy things. But Ryan preferred chasing butterflies instead of footballs. Her dad scheduled extra “father-son” time, thinking that might have an influence. But nothing changed. “The next step was to eliminate all girl things — can’t write about girl things, can’t draw girl things, can’t talk about girly things … and that just didn’t feel right,” says Sabrina, Ryan’s mom. They decided to stop resisting and allowed Ryan to start taking small steps into the outside world, at a nearby park, for instance, where she wore her girl clothes. For her kindergarten Halloween party, Ryan dressed as a princess and, shortly after, asked her parents to refer to her as “she,” a request to which they agreed, though it took a few months to adjust. “There’s a realization that it’s not a phase or something that’s ending when the preschooler gets to kindergarten,” says Kevin Gogin, the program manager for school health programs at the San Francisco Unified School District, which recently added a transgender category in student health surveys. The survey found that 1.6 percent of high school students and 1 percent of middle school students identified as transgender or gender variant. Elementary students weren’t in the survey, but Gogin says the district has seen more young transgender and gender variant students, too. Sixteen states and the District of Columbia have transgender rights laws, according to Michael Silverman, the executive director of the Transgender Legal Defense and Education Fund in New York City. He is representing the family of Coy Mathis, the 6-year-old transgender girl in Colorado. But even in states that don’t have laws, he says districts are often open to guidance. “By and large, most educators want to do the right thing and want to know how to treat all of their children equally,” Silverman says. But often, they don’t know how. In California, which has had protections for transgender people for some time, a new law requires schools to provide transgender and gender variant students with “equal and full access to programs and facilities,” such as gender-neutral bathrooms, if need be, and private changing areas for gym and sports. There can be resistance, of course — even in families and friends, as Ryan’s parents discovered. Neighbors in the Chicago suburb where the family lived when Ryan was born stopped asking about or acknowledging her when she started dressing in girl clothes. “It was as if she no longer existed,” Sabrina recalls. Cousins made fun of her, too, and once shut her in a dryer to taunt her. Sabrina and husband Chris sat their family members down to talk and, over time, they say they came to an understanding. “Our commitment is that our children are in an accepting, loving environment — and if someone’s not on board with that, then they’re not going to be around,” Chris says, calmly but firmly. They also moved to a neighboring suburb, where some said a particular elementary school would be more open to Ryan. They still fear a harsh reaction from people outside their community. But they say most people locally have been accepting. And she notes how well the staff at Ryan’s school has handled things. She remembers meeting with the principal and teachers at the end of Ryan’s kindergarten year. She told them that Ryan would likely enter first grade as a girl, then came home to find that Ryan was ready to make the transition — right then. “I don’t want to do this anymore,” Ryan told her parents, referring to what she now calls the “revolving door” of changing her appearance from boy at school to girl at home. They were ready, and allowed Sabrina to explain things to Ryan’s classmates — that Ryan liked to dress in girl clothes and liked girl things. One boy talked about how he’d once worn his sister’s shirt when his own got wet. A girl said she’d worn her brother’s boots. And then the kindergarteners moved on, Sabrina says. Eli Erlick, 17, is a transgender student and graduating high school senior in Willits, Calif., a small town in the northern part of the state. 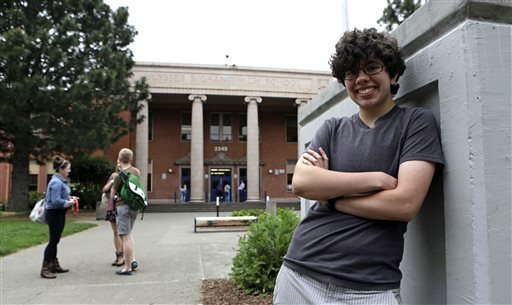 Transgender student Scott Morrison during a break in classes at Grant High School in Portland, Ore. Morrison, a graduating senior, moved to Oregon from Virginia three years ago. He transitioned from female to male a year later and says support from his mom, his friends and his new school – and help from a counselor – likely prevented him from committing suicide. Of course, how a school staff and a community react still varies widely from place to place. But overall, attitudes about differences in gender identity have been changing, even in the last decade, says Eli Erlick, a transgender student and graduating high school senior in Willits, Calif., a small town in the northern part of the state. When Erlick began her transition from boy to girl at age 8, she says that even she didn’t know what the word “transgender” meant. 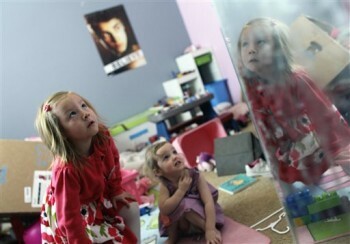 She just knew that she wanted to live life as a girl. “I thought I was the only person like this,” she says. School was difficult. Some teachers made fun of her in front of the class, she says. To avoid dealing with which bathroom to use, she would pretend to be sick, so she could go home and use the facilities there. Some schools in other states are doing the same. “There is definitely more awareness,” says Kristyn Westphal, vice principal at Grant High School in Portland, Ore. There, they’ve established a student support team to determine how well the school is meeting the needs of transgender and other students. Earlier this year, the school also created individual gender-neutral bathrooms that any student can use. Bathrooms often become a focal point because, when children are young, the transition is often more “social,” a change in clothing and hairstyle. As some kids move into puberty, they might use hormone blockers and, eventually, start hormone therapy to help their bodies transform from male to female, or vice versa. But any kind of surgery, experts say, is still relatively rare, even in adolescence. Ryan’s parents will consider these options later. But for now, Ryan sees no reason to choose one gender over the other — “at least until I get married or something,” she says. So she uses a separate bathroom at school, as the principal has arranged with her parents. A separate bathroom was not, however, a workable solution for the parents of Coy Mathis, who are suing their school district in Fountain, Colo. Kathryn Mathis, Coy’s mother, says it’s about more than that. “If it were just a toilet, then just having the gender-neutral option would be fine. But it’s really about being accepted,” Mathis says. The school district has declined to comment on an ongoing case. Mathis says she’s heard from several parents who’ve made the decision for their transgender children to go “stealth.” In other words, they make the transition — from boy to girl or girl to boy — and then move, so no one knows. “That’s how they’re doing it … because there aren’t laws to protect them,” Mathis says. Even in Ryan’s case, the initial transition at school wasn’t always smooth. While her own younger classmates were accepting, older kids called her “gay” and a “fag.” Early on, a few followed Ryan around on the playground. “Are you a boy or a girl?” they’d ask repeatedly. Her parents had prepared her for this type of reaction as best they could. Ryan, who her parents say is a strong-willed, independent kid, was mostly just annoyed. Still, she was relieved when her principal quickly stepped in to enforce the school’s anti-bullying policy. One mother also recalls how, early on, a few other parents worried about their boys being around Ryan — that it might cause them to be confused about their own gender. But that talk eventually dissipated, she says. Sabrina took it upon herself to speak about Ryan at school curriculum nights, to answer parents’ questions. And now, the principal says, it as a non-issue. “Ryan is Ryan,” she says. It’s not been as easy at other nearby elementary schools, where there’s been more friction over the few other transgender students. Some administrators have come to Ryan’s principal for advice — and she’s already been in contact with her counterparts at the middle school Ryan will eventually attend. No one expects that adolescence will be easy. “The more challenging times are up ahead, and we’re clear about that,” Sabrina says. But Scott Morrison, a transgender student at Grant High School in Oregon, says having support at home and at school, as he did, will make a big difference for kids like Ryan. Morrison, a graduating senior, moved to Oregon from Virginia three years ago. He transitioned from female to male a year later and says support from his mom, his friends and his new school — and help from a counselor — likely prevented him from committing suicide. According to a 2010 National Transgender Discrimination Survey, 41 percent of transgender people surveyed said they had attempted suicide. That figure rose to 51 percent for those who said they’d also been bullied, harassed, assaulted or expelled because they were transgender or gender nonconforming at school. The survey was a joint project of the National Center for Transgender Equality and the National Gay and Lesbian Task Force. With more support and an ability to live more openly, however, some wonder if it will be better for Ryan and this up-and-coming group of transgender and gender variant kids. Ryan is, too. “It’s just made me feel more strong and confident,” she says of the support she’s gotten from her parents and her school. People who know her say that’s true. She is a bubbly kid, they note. She loves to draw, sing and write poetry, loves sports and running. 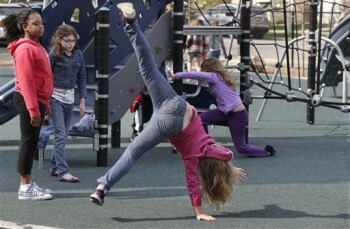 On the school playground, she can be found in the middle of a group of girls, doing cartwheels and playing tag. “Most people forgot that she was ever a boy,” says one of her girlfriends, a fellow fourth-grader. If her parents ever question their decision to let Ryan go public at school, they say they pull out her first-grade photo and compare it with the one from kindergarten, taken when Ryan was still hiding her girl self. On the Internet: Trans Student Equality Resources, GSA Network.